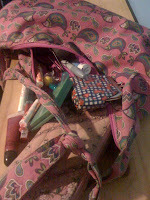 What my purse, and the contents inside say about me. What you didn't know a purse could talk? As a teenager I pretty much refused to carry a purse, and when I did decide to be nice and lady like I usually left it somewhere. You know slung across the back of a chair at a restaurant, in the dressing room of the local department store, in the floor of a friends car, even at a couple of parks. Lets just say times have changed a little. Today my purse is a staple in my everyday life. My current purse of choice is a sling style. That could change tomorrow, I change purses, almost as much as I like to change my hair. What can I say I get bored. Anyways back to the purse this purse like I said is sling style with birds stamped all over the material. I think they look sort of like peacocks that have been fed steroids, and dyed the color of Easter eggs. What the outside actually says about me. Well lets start with the color it's bright pink which is what made me buy it in the first place. I love pink! The style of the purse is easy to manage and gives me the ability to be hands free since I just sling it over my shoulder and go. The style also says I have a inner hippie chick begging me to buy a broom skirt, and dig out my oldest flip flops from the bottom of the closet. You know and be that free spirit, peace loving, girl with Carol King singing in the background "I Can Feel the Earth Move Under My Feet". Okay okay maybe that's getting a tad carried away. So lets move on and dump the inner guts of my purse on the table. First inside you will find my wallet that I have had since I was in high school. The wallet is full of business cards. Pretty much from anyone who has ever given me one. Hey you never know when you need the services of clown who's main talent is to craft animals out of balloons. This collection says hey this girl fights against being a pack rat, and keeping everything. Not to mention I have had the wallet for over 10 years. Also my wallet has the total of zero cash in it. This says I spent it at Sonic Happy Hour =). There is also lip gloss, clinque compact, ponytail holder, and little pink mirror. Which of course says I think about beauty, but actually have little to actually ever use these items to freshen up. Not to mention my hair is to short for a ponytail at the moment anyways. Now then there is a camera which says I don't want to miss anything not even the little moments, but usually do. Now the I must be prepared list: an extra pacifier, wipes, candy, and couple of toy cars. This just screams MOTHER, as if the three children tagging along beside me wasn't obvious enough. Crystal light on the go because well I am not sure how that ended up there. I don't even like the stuff. Sunglasses which I never wear correctly. I mostly use them for a headband to keep my hair out of my face. A sharpie because heck you never know when someone might want my autograph. Lastly my IPhone never leave home without it. Unless I forget it. The IPhone shouts that this girl loves the Internet so much she likes to have it 24/7 true story. I get a little cranky without it. As for the actually minutes on the phone I never hardly use them. I am not big on talking on the phone, which is kinda funny because I sure love to talk, but I had much rather talk over good food and a Margareta with no children present. That is if I want to have a real conversation that gets to last more than fifteen seconds before being interrupt by one of my adorable rug rats. Well folks that about wraps it up as far as what my purse has to say. 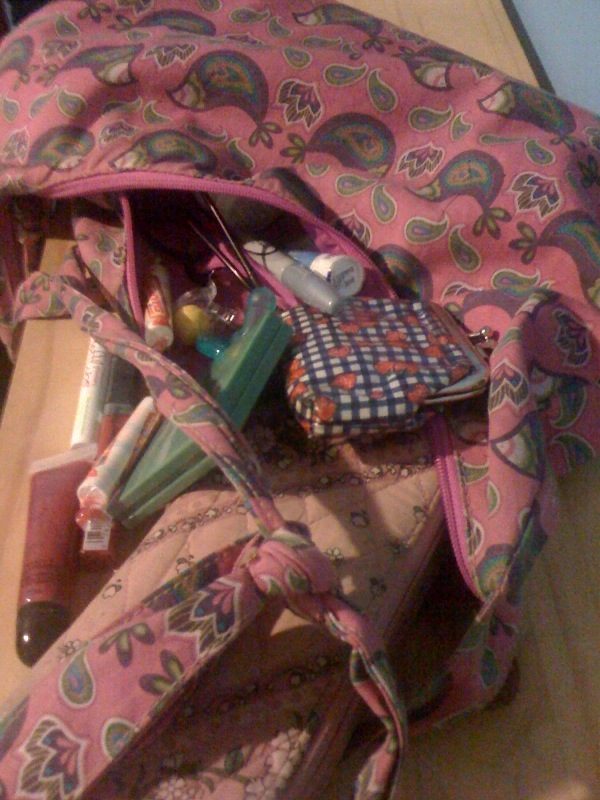 Besides the lint in the bottom of my purse we covered just about everything. So what does your wallet or purse say about you? Just something random to think about.